The vast majority of skin cancers are associated with exposure to ultraviolet (UV) radiation from the sun and tanning beds. The fairer your skin, the greater your chance of developing skin cancer. People with a history of substantial ultraviolet exposure — particularly during childhood — are at increased risk for skin cancer, as are those with occupations or leisure time activities that keep them outside for long periods of time and those who frequent indoor tanning booths. Both chronic and short bursts of ultraviolet exposure are associated with an increased risk. The most common sites for skin cancer are the face, neck and head because they are the most sun-exposed parts of the body. Do not burn or tan. Avoid UV tanning booths; spray tanning booths are safe. 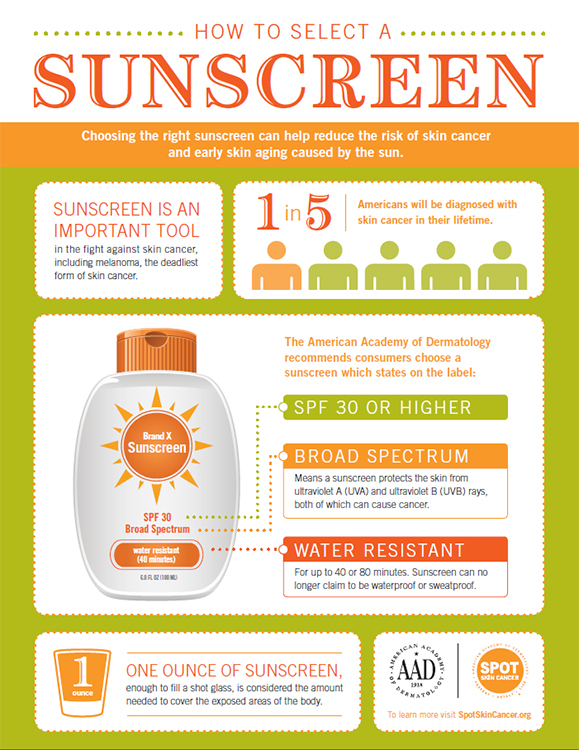 Use a sunscreen with an SPF of 15 or higher on all exposed skin every day. Apply one ounce (about a shot glass) of sunscreen to your entire body 30 minutes before going outside. Reapply every two hours. Keep newborns out of the sun. Sunscreens should be used on babies over the age of 6 months. Complications of burns, scars, infections, vaccinations, or tattoos. In addition, a number of diseases, medical conditions and treatments weaken the immune system and may make it more difficult for the body to fight off diseases, including skin cancer. These include HIV and other immune deficiency diseases, chemotherapy, and anti-rejection drugs taken by organ transplant patients. People with rheumatoid arthritis (RA) who are treated with biologic drugs called TNF blockers have higher rates of skin cancer than those who take other disease-modifying anti-rheumatic drugs. Having either breast cancer or melanoma raises the odds of developing the other. Exactly how the two cancers are linked is not fully understood, but genes may play a role. Women with abnormalities in the BRCA2 breast cancer gene are twice as likely to develop melanoma as those without mutations in this gene. Information about skin cancer treatment is available in our in-depth article on the subject. Staying out of the sun tops the list of ways to protect against skin cancer, but doing so can result in low levels of vitamin D, which comes primarily from exposure to sunlight. This deficiency may be even more pronounced in individuals with a form of skin cancer known as basal cell carcinoma. Vitamin D deficiency can increase your risk of developing autoimmune disease, heart disease, osteoporosis and bone fractures. Researchers at Stanford University Medical Center checked the vitamin D levels of people with basal cell nevus syndrome (BCNS), a condition that predisposes them to develop multiple basal cell carcinomas in young adulthood. Eighty percent of the participants said they used sunscreen daily, and most reported staying out of the sun during peak hours. Multiple blood tests taken during the two-year study confirmed that more than half of those studied had a vitamin D deficiency. Additionally, vitamin D levels were lower among those who were overweight, and winter levels were lower than summer levels. Overall, the participants were three times more likely to be vitamin D deficient than the general population. The researchers concluded that these results may be applicable not only to those with BCNS, but also to basal cell carcinoma patients in general, particularly those who limit their sun exposure. Screening for the deficiency and the use of vitamin D supplements may become an important part of the care plan for these patients.